By becoming members of West Cheshire & North Wales Chamber of Commerce, exporters can access a series of benefits specifically for them, as well as the rest of our comprehensive membership package. Whilst expert international trade advice is just a phone call away whether you’re a Chamber member or not, those who sign-up for membership can enjoy up to 50% off on our documentation services. Call 01244 669988 or 01244 669985 for more information. The Chamber runs an comprehensive set of International Training Courses that are accredited by the British Chamber of Commerce. This means that they meet a high quality standard and successful attendees will gain a Foundation Award in International Trade, certified by the BCC which is equivalent to an NVQ 2 qualification. Chamber Members receive and exclusive discount on course prices which can be found here. With expert speakers, and the opportunity for members to share their experience of international trade, the Trade Forum offers Exporters, at all levels, a chance to expand their knowledge. Whether you are a member of the Chamber or not, you will have the opportunity to attend our International Trade Forum. However, Chamber members have exclusive access to the International Trade Forum Member Area on our website which offers further support to exporters. For more information click here. 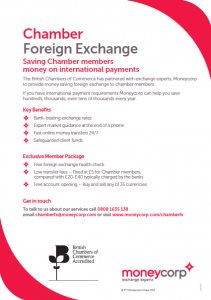 The British Chambers of Commerce has partnered with exchange experts Moneycorp to provide money saving foreign exchange to Chamber members. If you have international payment requirements Moneycorp can help you save you money every year. To see how you can save money on international payments, click here or on the flyer below to find out more. Chamber members can access the benefit by logging into ‘Access Your Benefits’ section in the Members Area of this website. The Chamber and DHL want to help you hit the ground running. That’s why shipments are half-price for all members of West Cheshire & North Wales Chamber of Commerce in their first year of exporting with DHL. Enjoy 50% off exporting for a year, allowing you to make major savings each time you ship and invest your money into other areas of your business. It’s an unmissable opportunity to establish your business on an international scale with the cost pressures seriously reduced, as well as start recouping your Chamber membership fee from your first shipment. Not have shipped more than five times with DHL in the past 12 months and be aiming to build your international business. The Chamber recently held its first Export Seminar which highlighted the important changes that come into force with the Union Customs Code and the significance of becoming an Authorised Economic Operator. With more seminars planned in the future these events are discounted to members to offer another great benefit for exporters that join the Chamber as members. 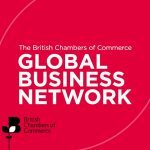 With 52 Accredited Chambers in the UK, 17 Accredited Chambers of Commerce/Business Groups globally and increasing annually, with an aspiration to grow to 40 by 2017 – the BCC Global Business Network is uniquely placed to provide an unparalleled level of support to UK businesses. As a Chamber member you have access to the Global Business Network. Please click the below image for further information. Our new Export/Import Clinic is a great way to find answers for your international trade questions. In particular, Customs processes and procedures and compliance, applying to become an Authorised Economic Operator and the new Union Customs Code to name but a few. As a member of WCNW Chamber you will be able to attend for free.